Now that the Decorate By Color series is over, I said I wanted to start a new series every Friday. It was fun to have a “theme” to talk about each week. I didn’t know what I was going to do and then the clouds parted, the angels started singing and I found out pretty quickly. 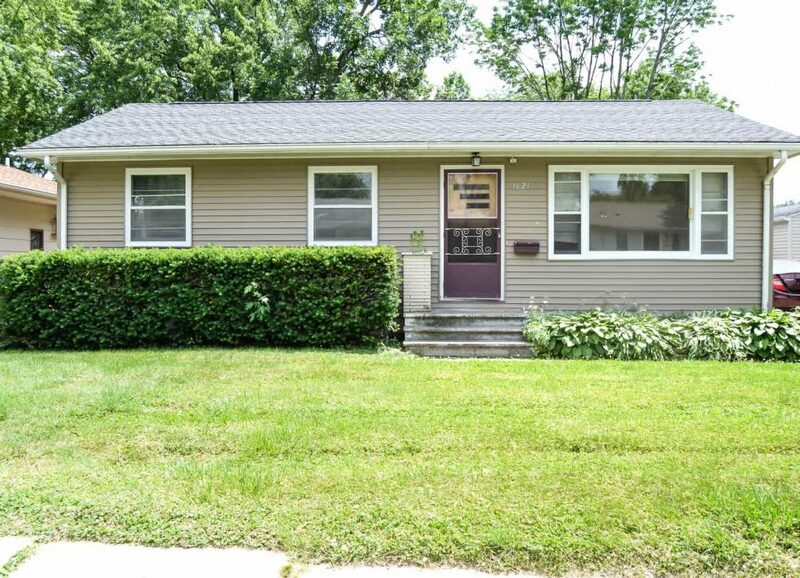 Matt and I closed on our first flip house last Friday! I thought it was ironic we were closing on a Friday (not planned). A light bulb went off while we were signing papers. This project will be my next “series”! Welcome to the #MCDFIRSTFLIP – our first fixer upper to flip! 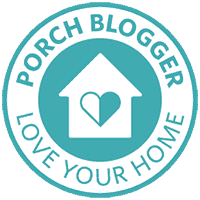 I am going to keep today’s post short and give you a tour of the house like it was the day we got the keys. Welcome to the little house that could. The fixer upper already had a new roof and new siding. Those are big budget items that we don’t have to worry about. We are going to replace the screen door on the front and paint the front door. We are also going to spruce up the front stairs and planter. 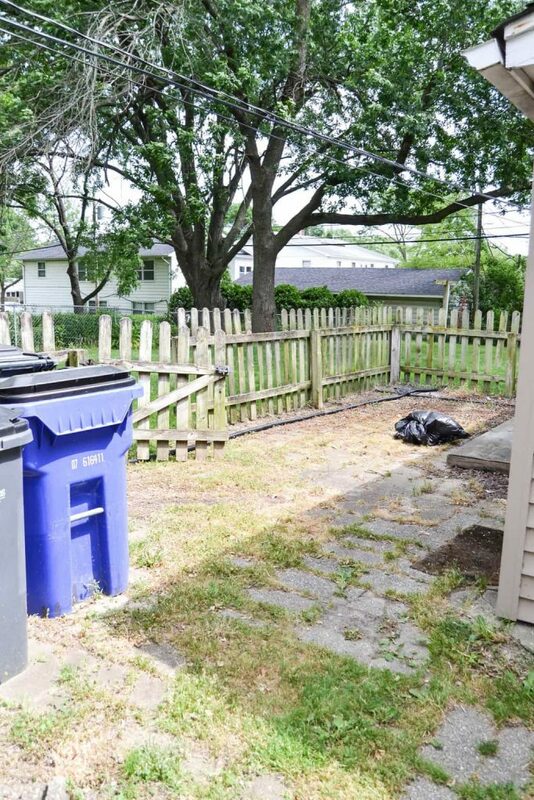 We will clean up the plants on the right side and trim the bushes on the left. We have treated the yard to get rid of the weeds. The side, screen door and big door will also be replaced. Matt will be working his magic on the landscaping here as well. 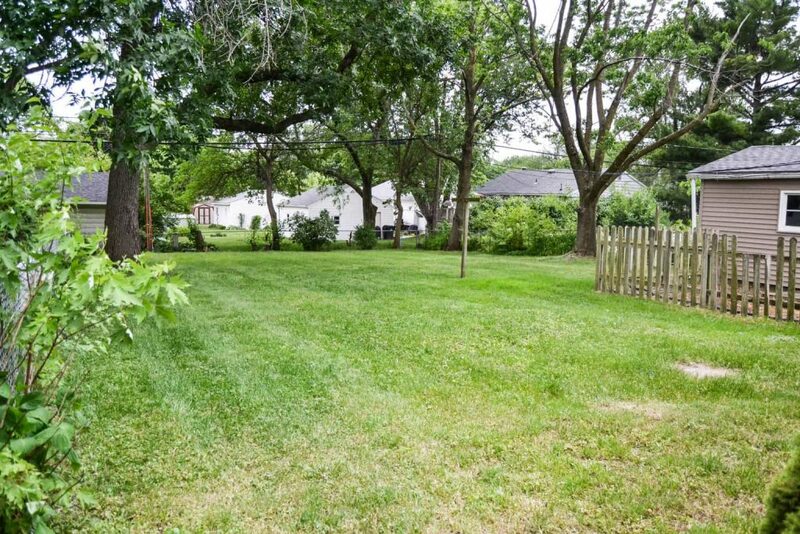 The back yard of the fixer upper is a great size. We have removed the old fence and when we removed some of the patio stones, we found out they were more concrete than stone. Many of them crumbled to pieces but we will try and salvage the ones that didn’t. We will probably need some sod to help fill in the area. We have some trees to trim and a broken clothes line to remove. What I love most about the backyard is that you don’t look straight into anyone else’s house! It is pretty private. It is also fenced all the way around except at the driveway. As soon as you walk in the side door, there is a step-up into the kitchen. We will replace the counter tops, paint the cabinets, get new hardware and get a new light fixture. 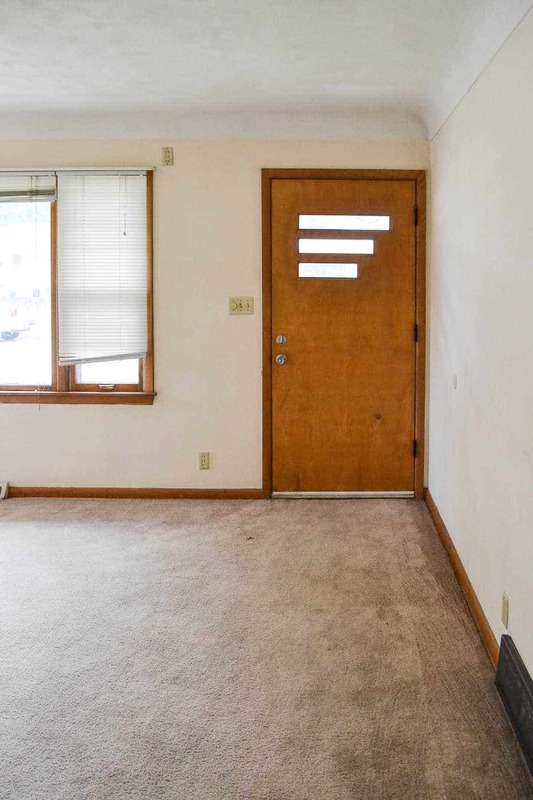 I am not a fan of the flooring, but it is in great condition. We will be leaving it. I really want to stay on budget and on schedule. We will add a stove, get a new dishwasher and maybe a new faucet. 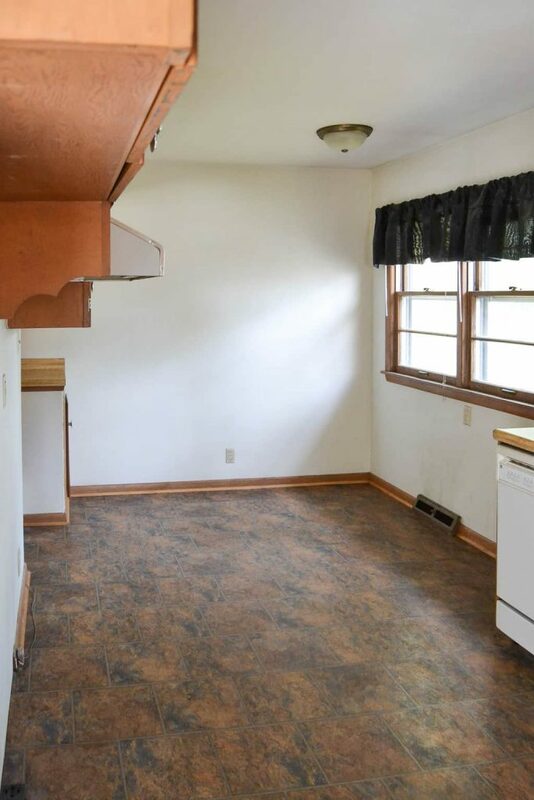 In the eat-in area, we are thinking of adding a ceiling fan. We will replace the countertop on the half wall on this end as well. 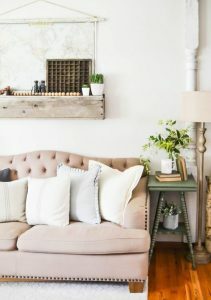 The living room is a good size and I love the coved ceilings. 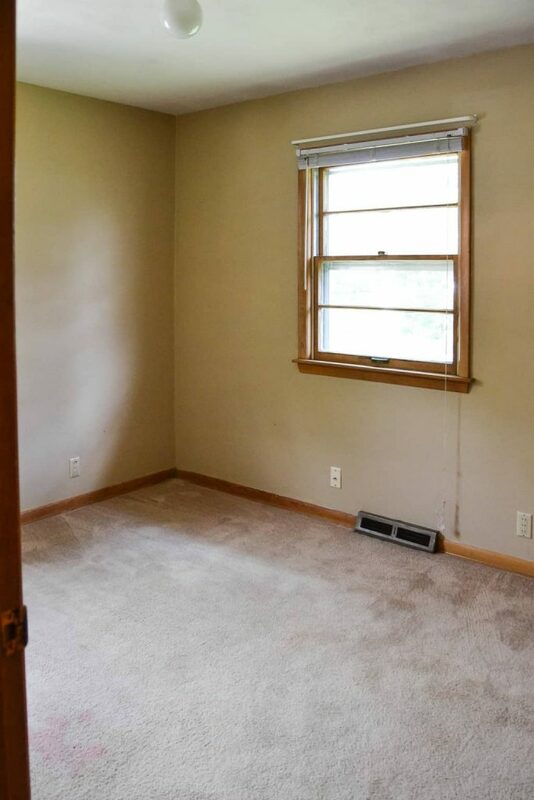 This room needs paint, new carpet and vent covers. The blinds will come down and I will probably add some curtains. 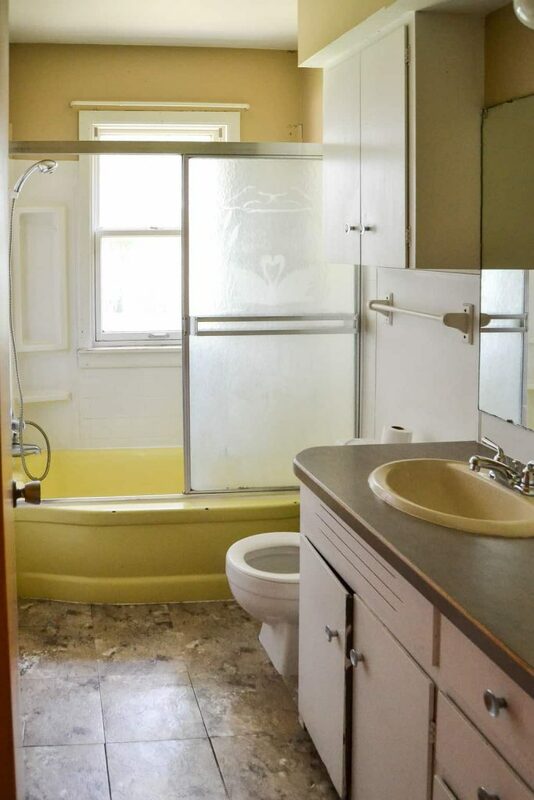 The bathroom needs a lot of work. We will remove the shower doors, vanity, flooring, cabinet above the toilet, mirror and light fixture. We have gone back and forth about recovering the tub or ripping the entire thing out. Again, budget and schedule are important factors in everything we do. There are three bedrooms in the house. The work in each one is pretty much the same. We will paint, do some work on the windows and get new fixtures. 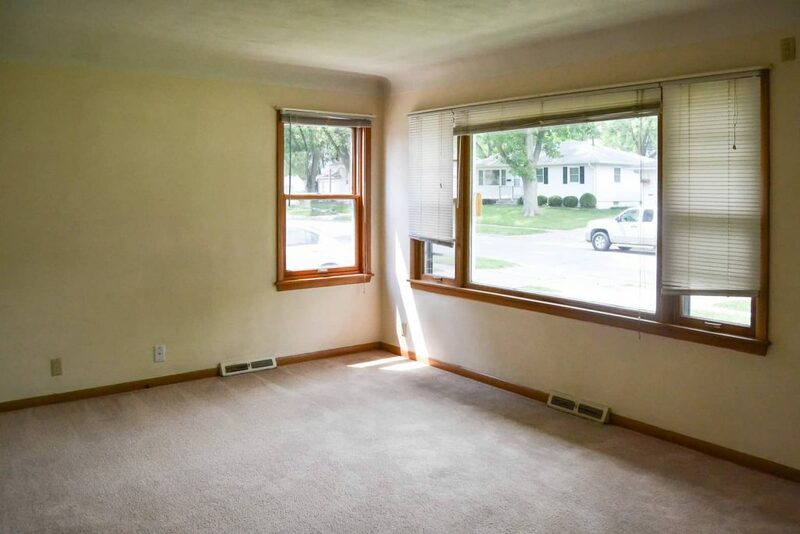 The most exciting thing is that all of the bedrooms have hardwood floors! We will be ripping out the carpet to reveal the pretty floors. 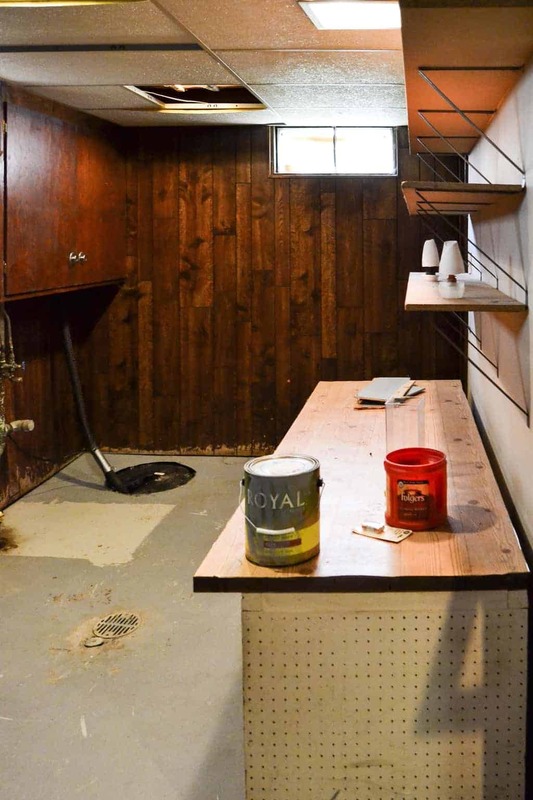 Like the bathroom, I think the finished basement will make a big difference in the house. 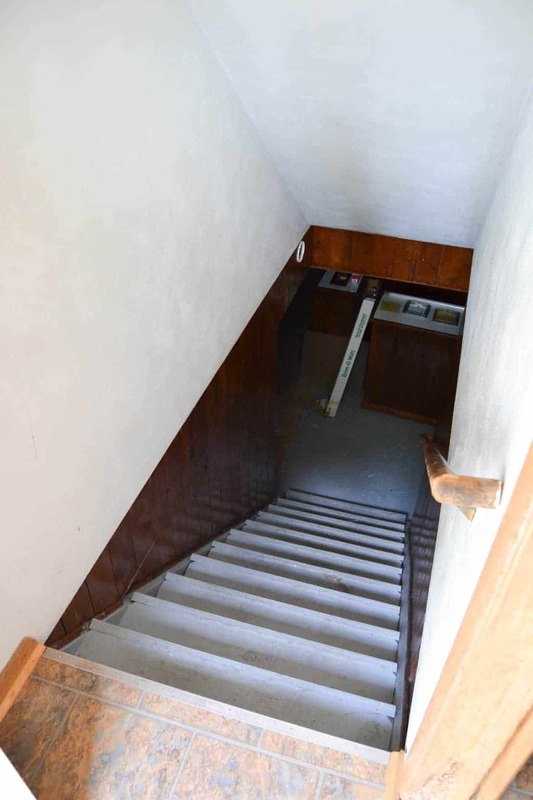 The stairs will get new paint and we will paint the paneling here in the stair wall. 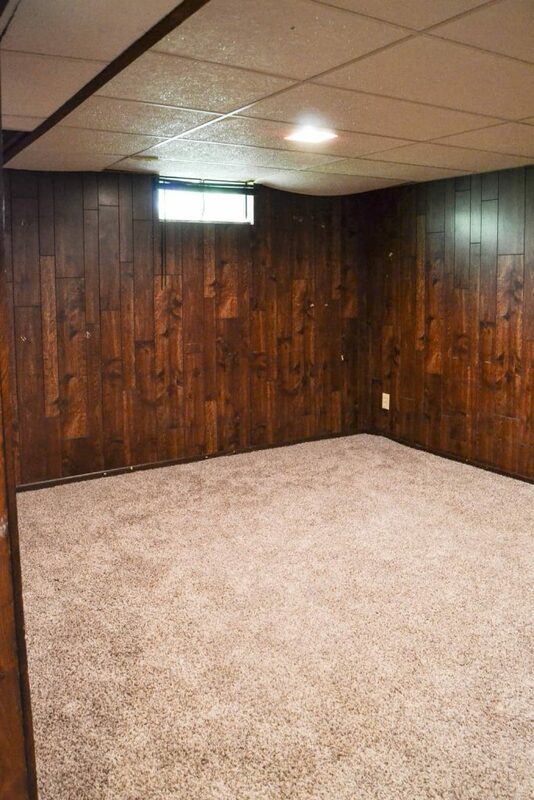 Most of the basement has the cheap paneling on all of the walls. The ceiling tiles are missing, broken and gross. The basement has a great-sized family room. We were going back and forth on the paneling, but after I went live on Facebook with a tour, I have heard from many of you that I can paint the paneling!!! 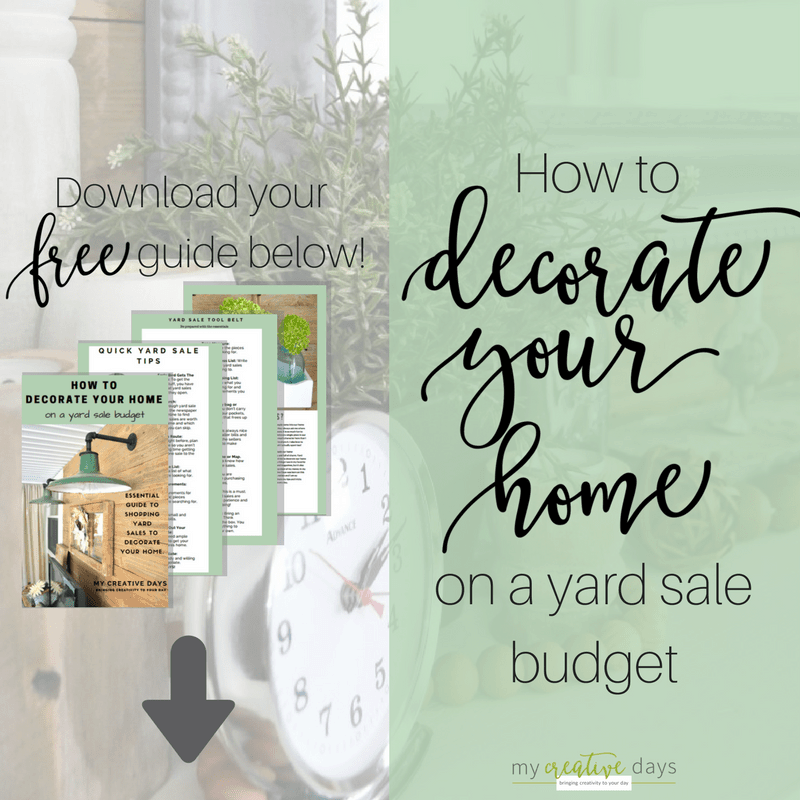 This is a game changer and huge budget-saver for us! I am definitely going to give it a try to see how it works. We will replace all of the ceiling tiles and add a chalkboard to this wallpapered art feature. 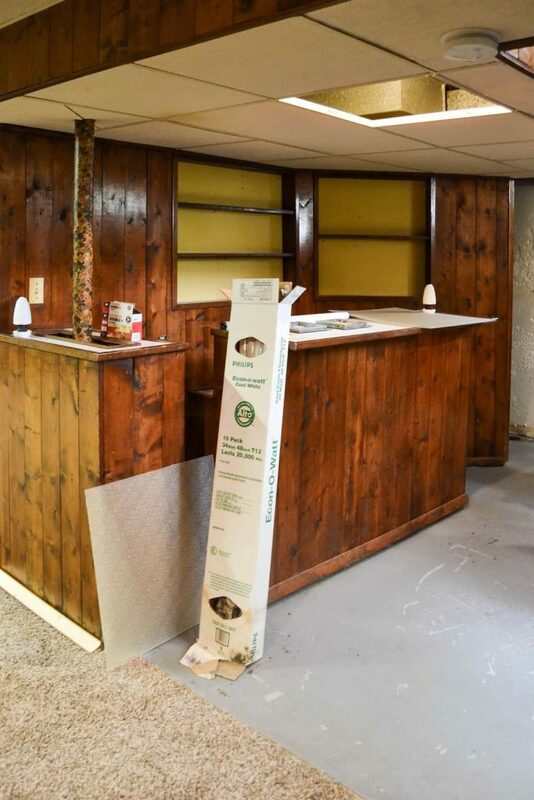 There is a bar area at the base of the stairs that I think would be fun to keep and spruce up! 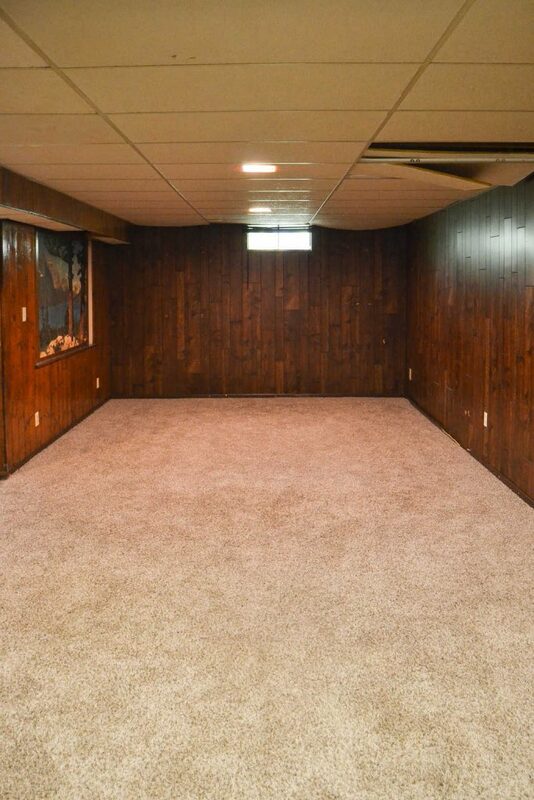 The other end of the family room in the basement has this “feature wall”. Next to the “feature wall” is another room. 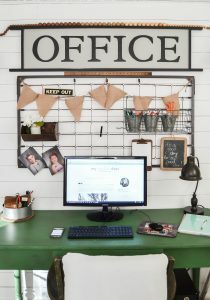 I thought this would make a great office space! On the other side of the basement stairs is what I am calling the Laundry Room. The laundry hook-ups are in here and since it is open to the rest of the space, I want to make it look cute. Again, we will paint and replace the ceiling tiles. The cabinets on the wall will be painted and there will be new knobs. 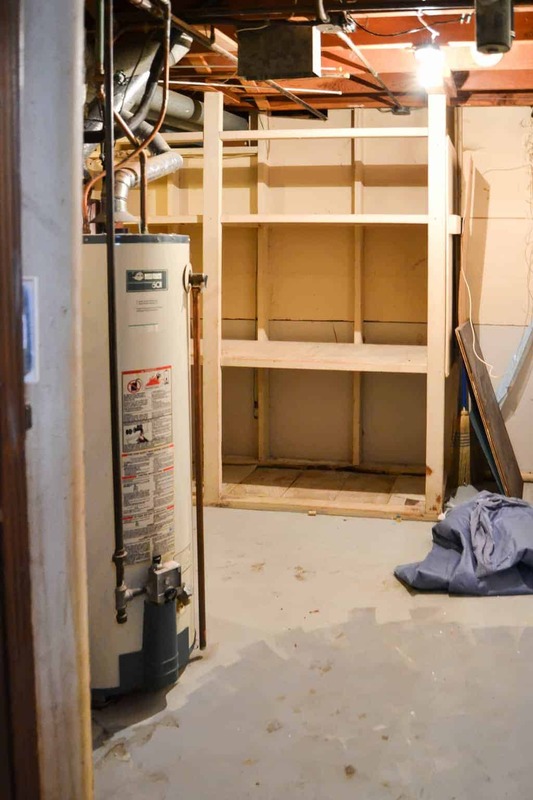 We have ripped out the shelves and the base cabinet thing on the right side of this photo. The house has more storage than our home does! The room next to the bar wraps around and houses the furnace and water heater. There it is! 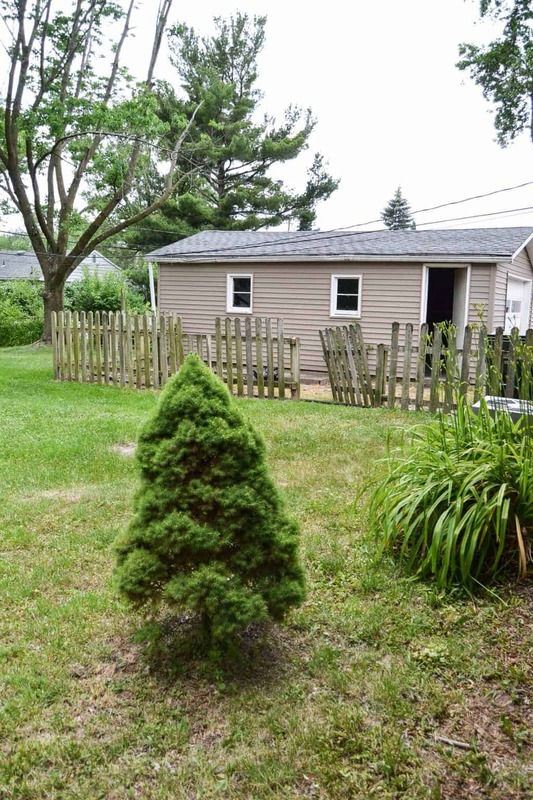 The little house that could. 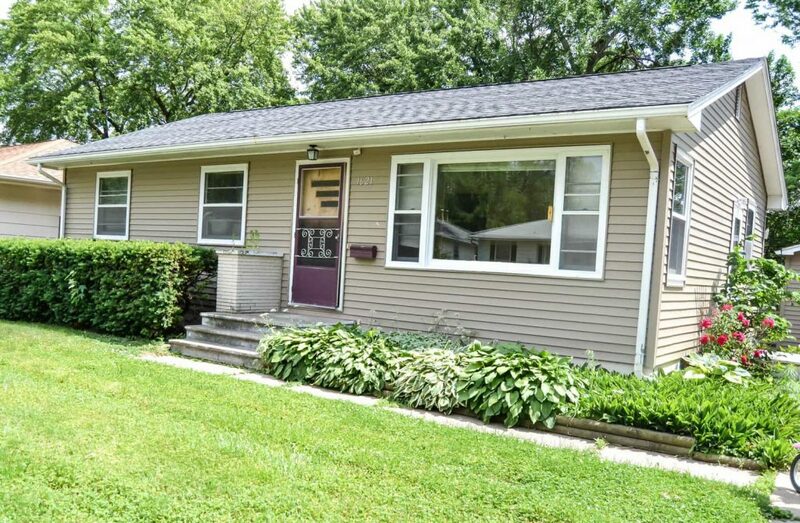 Our first fixer upper to flip. We are proud of it. We think it was a good investment and we know we have a lot of work ahead of us. The paint budget alone is CRAZY because every inch needs paint. A lot of time will be spent here for the next month, but we are looking forward to the challenge. I will keep you posted of the progress and the things we learn along the way. 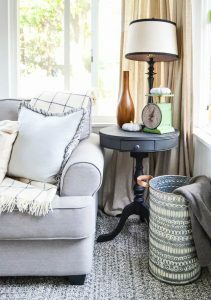 My goal is to do the fixer upper updates every Friday. I am already finding that one of the hardest things will be to find balance. Matt works all week, the kids are off for summer and I still have my blog work to stay on top of. It will be a juggling act, but we will manage. Let this new journey begin! Like I said earlier in the fixer upper post, make sure you are following My Creative Days on Facebook and Instagram for updates and videos on there when I can. All cosmetic. Pretty nice find. Don’t you need egress windows downstairs? 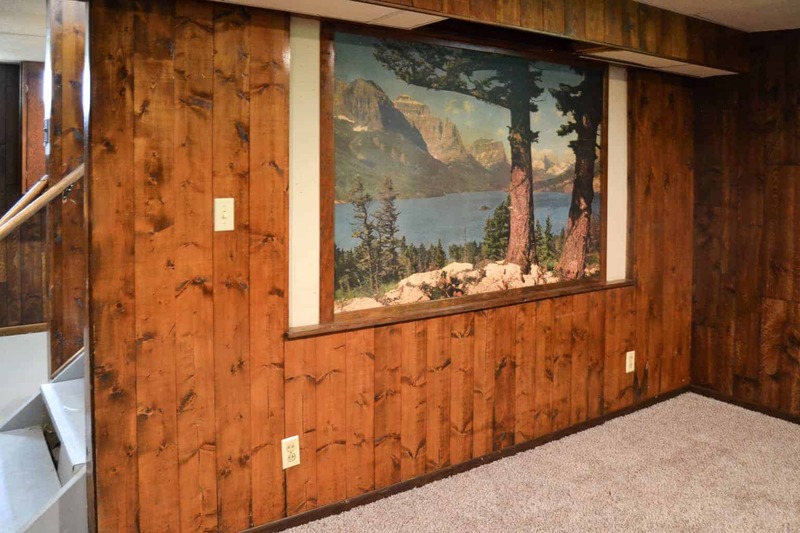 YES you can paint that paneling!! 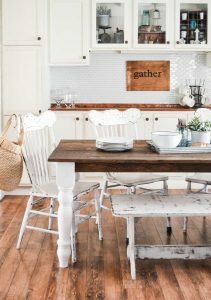 We had similar paneling in our current home and one of the first things we did was clean it well, prime and paint it a neutral color (I wanted white, but hubby isn’t a big fan of white!). It looked amazing and lasted until we finally pulled it down several years later and replaced it with something different. As you well know, paint can make a HUGE difference! There is SO MUCH POTENTIAL in that little house. And if you have it in your budget to add a deck on the back that would be a very inviting space. I can’t wait to see the progress and final pictures! Thank you! Yes, we said if we had more money in the budget, it would be fun to add slider doors in the kitchen and have it open out to a deck. I forgot to mention that you can also paint vinyl flooring. 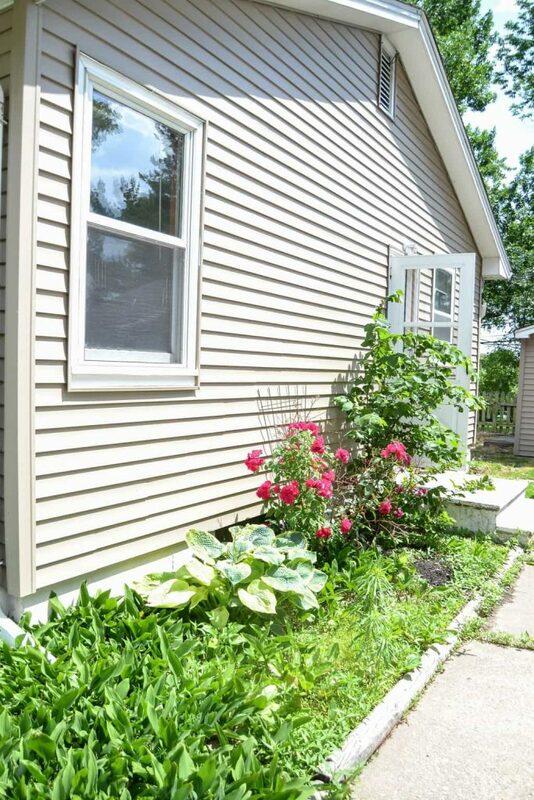 And with all of those hostas in the yard, you can divide them up and spread them all around the house. Yes! We are going to move the hosta around. Matt loves landscaping so we will use what we have there to fill in other places! Thank you so much! I am so excited for you and cannot wait to follow you as you bring new life to this cute house! You got this! No problem! 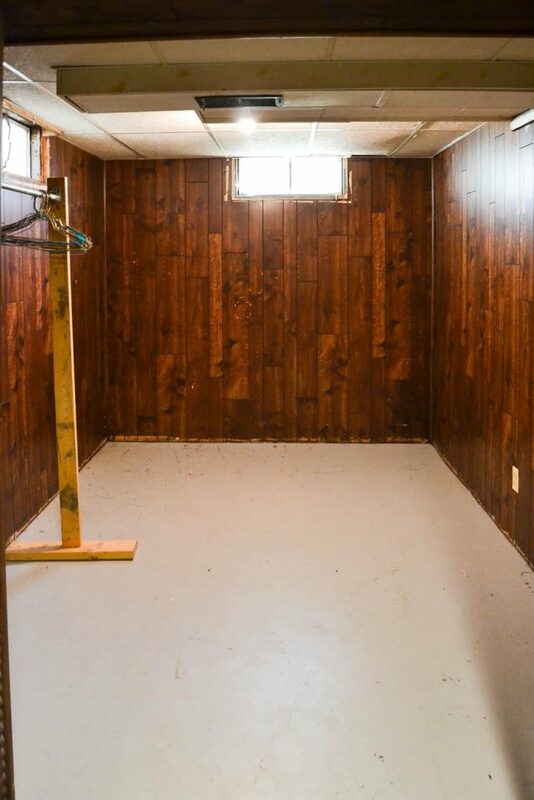 And yes, you can paint that paneling. 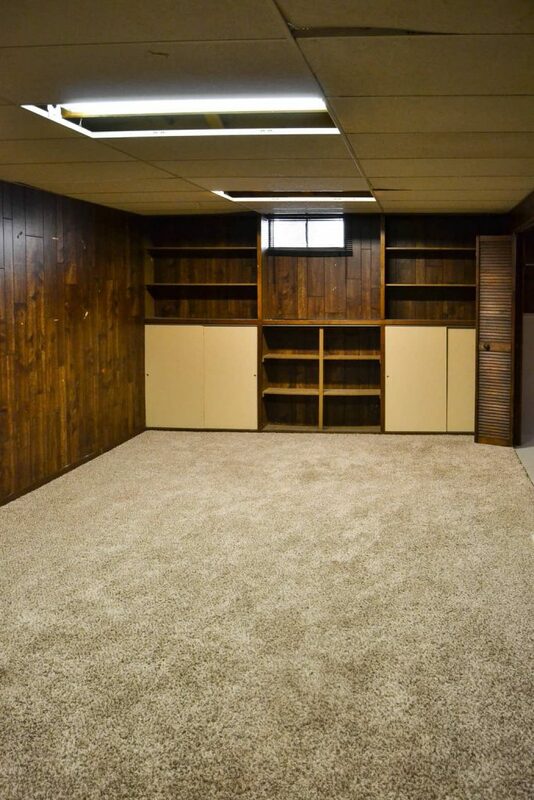 I painted the paneling in our basement, when you bought our house years ago, and it made the space look like new!!! Keep us posted and have a great summer! I love the front door. That tub looks like cast iron, you can always get it reglazed. 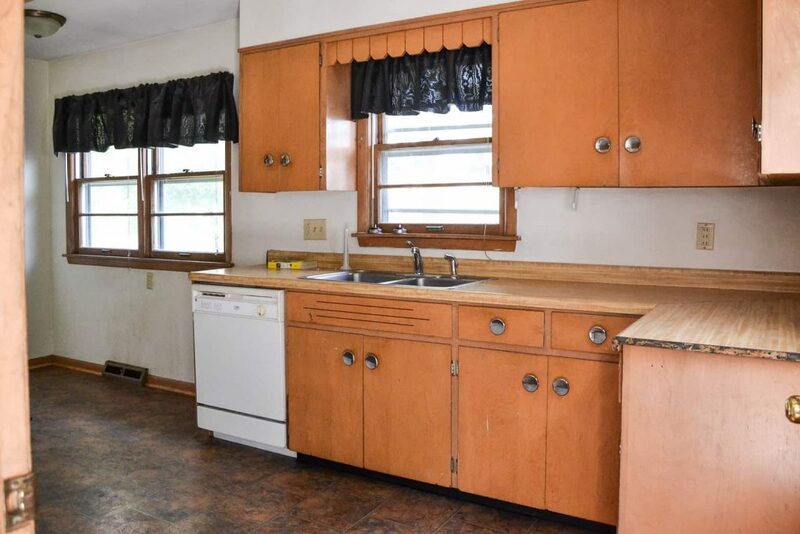 Once you paint the kitchen cabinets, the floor won’t look so orange. That is what we are going to do. 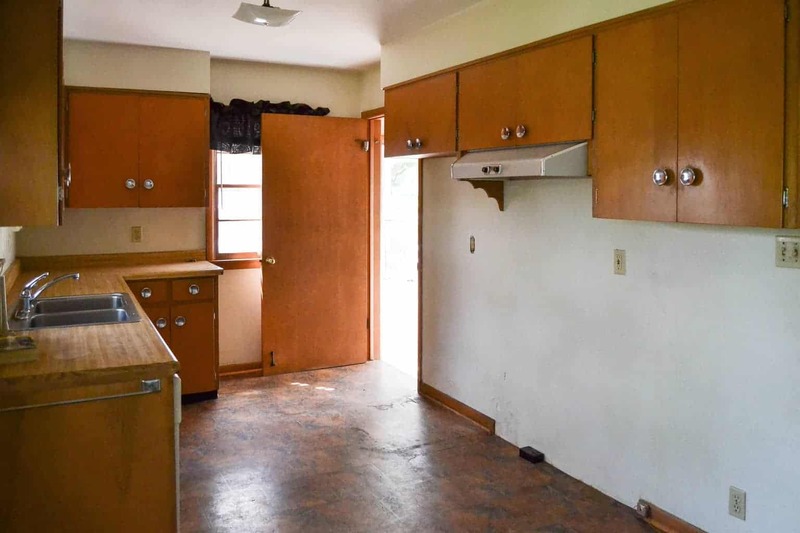 I am hoping with painted cabinets and new countertops, the floors will fade away. I might add some rugs as well. Thank you!